I usually only review CDs on first release but I came across one on the weekend that I need to rave about. I guess it’s not exactly a secret that I’m a huge fan of early 20th English art song. So, when I found a CD with most of favourites sung by one of my all time favourites it was pretty much bound to be a hit. 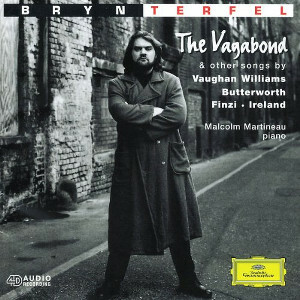 It’s a 20 year old recording by Bryn Terfel and Martin Martineau and it’s called The Vagabond and other songs. The disc includes Vaughan Williams Songs of Travel, Finzi’s Let Us Garlands Bring, both of Butterworth’s Housman cycles and three settings of John Masefield texts by John Ireland. The young Bryn’s voice is a touch lighter than today but it’s still a brooding dark thing though with delicacy enough for, say, Is my team ploughing? Martineau is a most skilled accompanist and the recording, made in Henry Wood Hall, is very good indeed. I can see this getting played a lot! 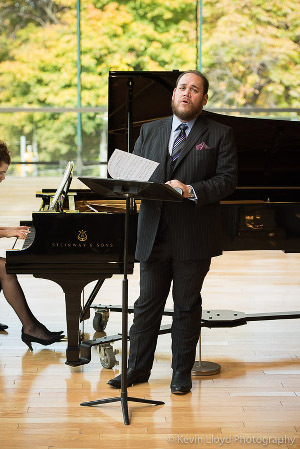 Baritone Quinn Kelsey, currently singing Germont père in La Traviata at the COC stepped down off the big stage today to give a recital, with Rachel Andrist at the piano, in the more intimate RBA. As befits the venue, he gave us a more intimate program. Ralph Vaughan Williams Songs of Travel and the less frequently heard Gerald Finzi cycle, Let Us Garlands Bring sandwiched three songs by Brahms. The Vaughan Williams is a pretty well known work, almost a recital warhorse. Kelsey showed considerable sensitivity in, mostly, dialling his big voice back for it. He is extremely expressive, occasionally I thought maybe just a touch too much so, and he has a surprisingly wide range of colours at his disposal. The contrast between the light, bright tone he used for The Roadside Fire and the much darker (and louder) approach to Youth and Love was quite striking. And that’s just an arbitrary comparison of two songs that follow one another. The rest of the set was equally varied. This guy is a lot more than “just” a big, Italianate Verdi baritone! And Rachel Andrist is so much more than “just” an accompanist. She brings a complimentary personality to every song with some real detail in the piano part that makes it seem quite fresh.